Among all this information there are real treasures, the experts agree. Almost two-thirds of respondents across the industry believe that using data as is a competitive advantage, according to a global survey of Oxford University. However, for most companies, it is not how much data they collect, but how they use the information gathered. Alone, the sheer amount of data nobody can oversee. Making use of it for your own company is impossible. That’s why the data has to be intelligently analyzed and processed — big data has to become smart data. However, in order to correctly analyze the flood of data and draw the correct conclusions from it, one must understand how devices and equipment work, but also social and psychological processes. For example, if you have a detailed knowledge of the equipment in the smart factory, and you know how to correctly analyze the values ​​that you have issued, you can develop a strategy that makes the system run more efficiently with better capacity utilization. The machines themselves can also analyze when they need maintenance, for example, and thus avoid expensive production downtimes. The same applies to the energy sector or trade. If smart meters in households and businesses merely collect information on power consumption and times, they will not support the transformation of the energy sector. What is more important is that the smart meters are connected to and control the devices. So the washing machine could turn itself on when solar panels and wind turbines report that the sun is shining or the wind is blowing — so if green electricity is abundant and needs to be consumed. And even online and offline retailers could use modern business analytics to anticipate the wishes of their customers and offer corresponding products — and to manufacture individual pieces even at the prices of mass production in the smart factory. The intelligent analysis of the data opens up completely new possibilities and business areas. By 2025, global sales of intelligent analysis methods for big data applications will increase to more than 85 billion euros, experts estimate. 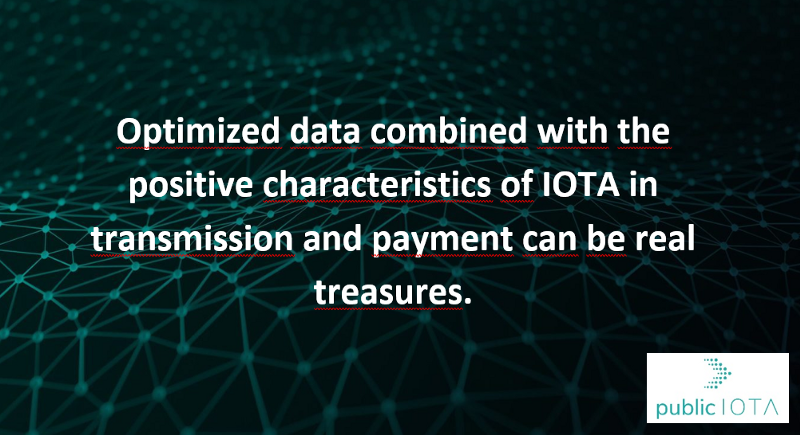 As I have already stated in other publications, the linking of different data, the plausibility check and the timely delivery of this refined data will play an important role in the future and IOTA is the key to the delivery and payment process. This generates an added value that is required by many applications. In order to understand that, I would like to bring an example from the area of ​​autonomous driving regarding the handling of data. • In order to relieve the power grid, it makes sense to charge the car when there is a high amount of electricity in the form of wind energy or solar energy. In dark periods, charging should be avoided because electricity is generated by fossil-fired power plants in these times. This saves CO2 emissions and, in addition, money, since in times of wind and overcast skies, the market price for electricity is even more expensive. That is also the reason why weather data and weather forecasts are very important. • Now another data variable comes into play, namely the usage times of the car. The car can of course only be charged when it is not in use and is at a charging station. This means that appointment data and scheduling forecasts over the times of use play an important role in meaningful charging of the electric car. Here, a rethink will begin in which part of the diary will provide data to a system. • It is also important to know the dates for the planned route. In addition to geographic datasets, the presence of charging stations also plays an important role, because only then can the car know where a corresponding charging station is located. These data must be available for specific parking. • Another record that needs constant updating is the availability of the charging station. If the selected charging station is currently being used by another car, then of course at this charging station the vehicle can not be charged at that time. This means the appointment calendar data of the charging station must be retrieved. The autonomous vehicle is independently charged with electricity and paid for with its own IOTA wallet. This will generate multiple records again. This simplified example shows just how many data sets are necessary to make it possible to charge the car sensibly. But the existence of the data is far from sufficient. There must be a plausibility calculation with a meaningful combination of these data that then flows into an optimization model. These data and calculations must be available in a timely manner so that this model can be used in practice. Only then can the electric vehicle be supplied with the optimal amount of electricity at the right time and at the right place and pay for everything autonomously with IOTA. In fact, the emissions balance of electric vehicles depends on the electricity mix with which they are charged. Compared to electricity from fossil-fueled power plants, electric cars powered by renewable electricity generate around 50 g less emissions per kilometer. That could be almost 1 t Carbon Emissions for a year. It therefore plays a crucial role when and where the electric vehicle is charged. Many data sets (in our case: weather, deadline, GIS and free capacity) must be processed and optimized. In practice, it will be much more, but it will turn out, however many variables I use, there is always the possibility that the variable that I did not include is the deciding factor. In our example of charging the electric car, this would be e.g. a sudden traffic jam on the highway, which increases the travel time by one hour and destroys the tank chain at the previously selected charging station. A fast new retrieval of the data sets with new calculations is thus inevitable to obtain a new optimal refueling model. Similar to the navigation system that calculates a new route because a traffic jam has been registered in the system. That sounds easy, but it’s not trivial. 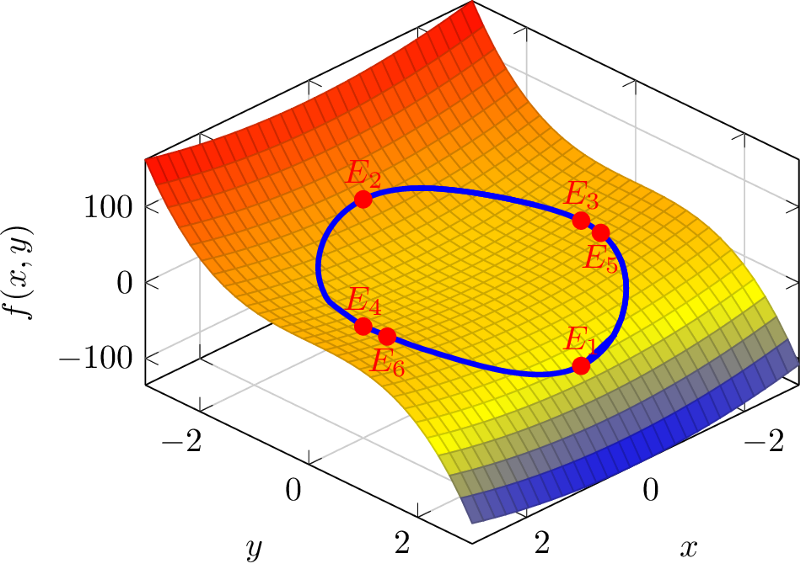 For the optimization calculations, optimizations with multivariable functions such as the Lagrange optimization method, game-theoretic models and probability calculations are to be included. You have to be prepared for that. So a lot of data is needed, which also has to be produced, provided and transferred to the Tangle elsewhere. This very simplified example shows very clearly that not only data retrievers but also data providers are existential for the functioning of such a system. Everything in the future? 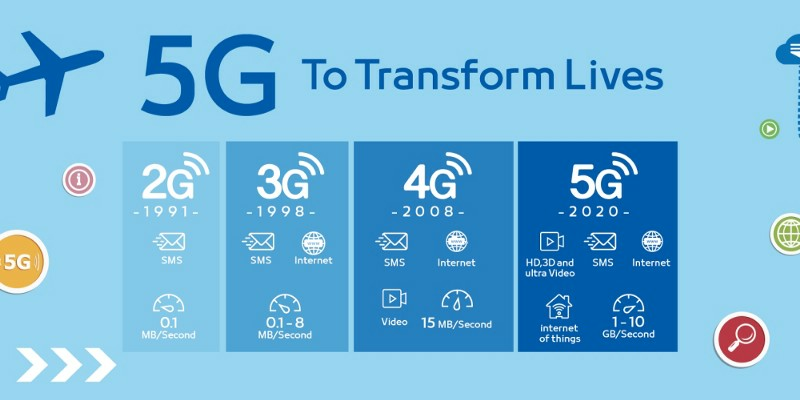 No, there is already a lot of data transfer going on today and very soon there will be many applications that both require the retrieval of data and reward the provision of data. In the real world, of course, there will be far more. However, it should also be mentioned that in the future there will be sensors everywhere that retrieve data. 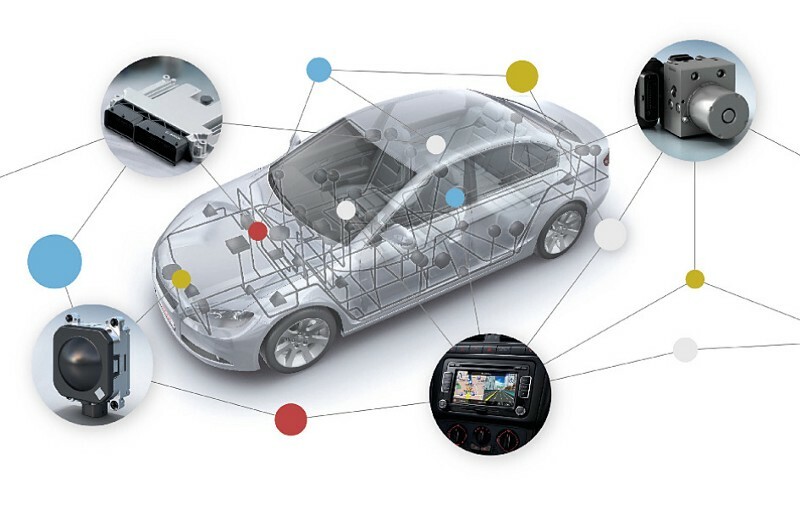 If we stay with our example of the car, then today already with countless sensors, many data are generated. But in the future, as already mentioned, the data alone will not do it. 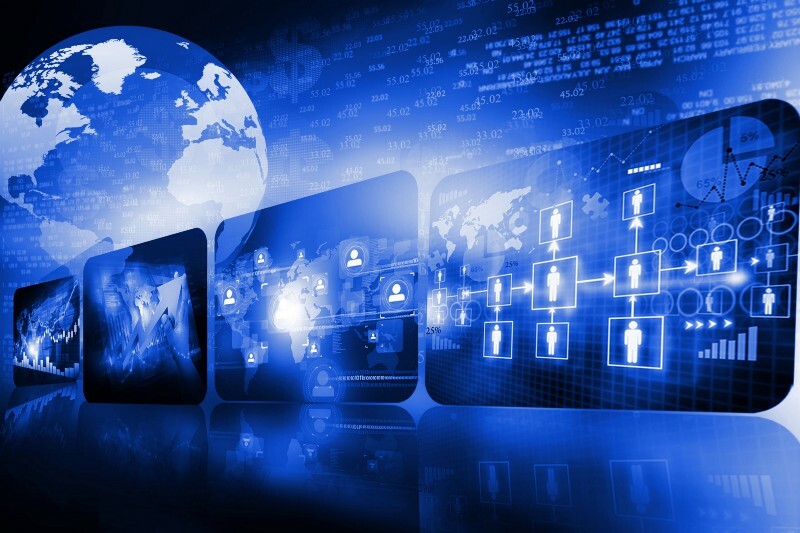 The point is to find out from the multitude of generated data those that are important and with which one can raise the true treasures by linking with other data and techniques. These will then be easy to monetize because they are needed by other systems. Now think about how many data chains and data transfers are required to operate a Smart City. 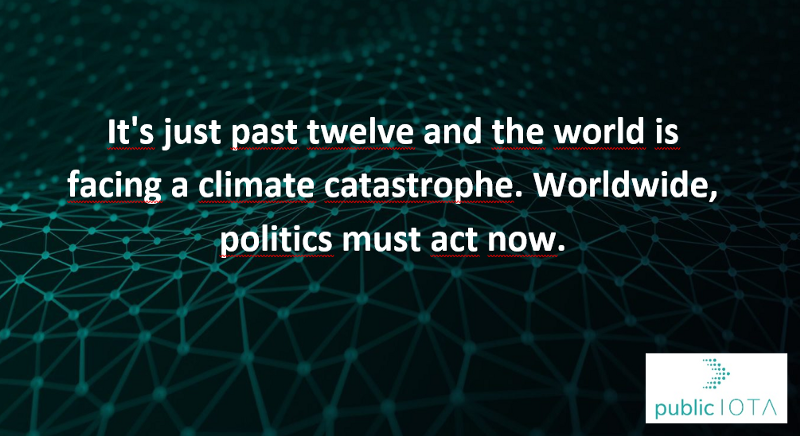 There will be a countless number of important datasets that certain systems need to be optimized in terms of climate protection and human function. Being an early adopter of Tangle’s data enhancement, optimization, and transportation and payment capabilities can be a support to this system and generate revenue. 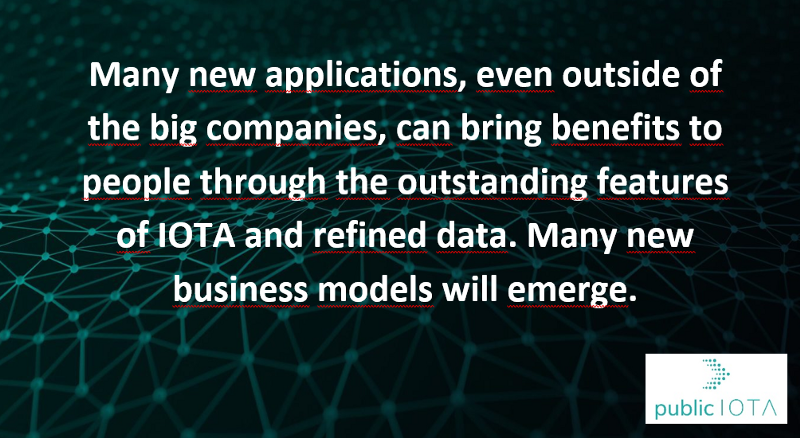 public IOTA will show you special possibilities in the near future. And here we come back to the beginning. 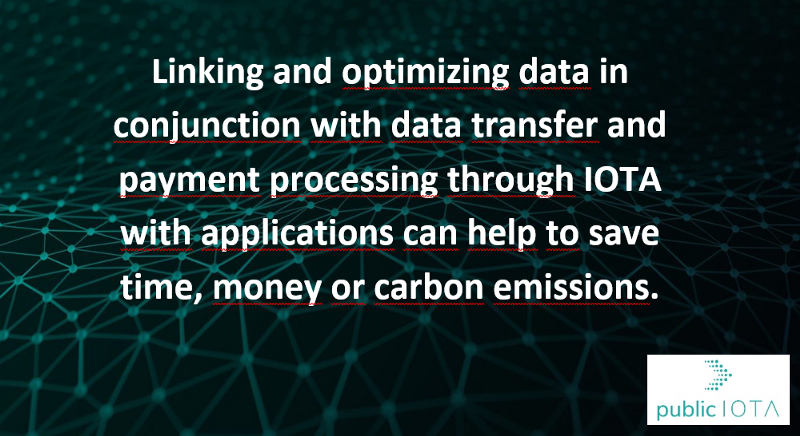 Optimized data and their transport and payment through IOTA Tangle can ensure that smart systems contribute to reduce Carbon Emissions and and help prevent the climate catastrophe. 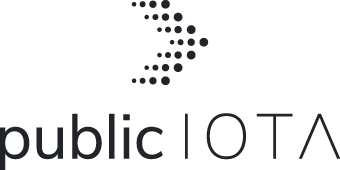 IOTA’s cooperation with UNOPS will also play a major role here.